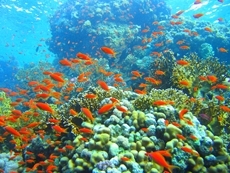 The sustainability of coral reef ecosystems, the cycling of nutrients in food webs, and the effect of cattle movements on the transmission of bovine tuberculosis are among the topics to be studied in 2010 at the National Institute for Mathematical and Biological Synthesis. The range of topics to be investigated advance the Institute's mission to foster new collaborative efforts to address biological questions using mathematical and computational methods. Newly formed Working Groups and Investigative Workshops for 2010 comprise researchers who will engage in creative and collaborative connections across multiple disciplines. NIMBioS congratulates the new recipients of support, including new Working Groups, Investigative Workshops, short-term visitors and long-term sabbatical scholars.